Paint is the most versatile form of surface finish. It offers infinite varieties of colours and textures and also gives protection to the surface. However the most expensive paint can produce disappointing results if the right type of paint brush is not used for its application. There are various types of paint brushes available, which are meant for different kinds of paints. Before painting a house, a home owner must consider the different types of paint brushes available in the market. Here we have tried to give brief information about different types of paint brushes and their different styles which can help a homeowner to make a rational choice considering the requirements of the house. Natural bristle brushes are used for applying oil based paints. Natural bristle brushes are made from natural sources such as animal hairs which include hairs of hogs, ox, badgers, camel, horse, etc. If natural bristle brushes are used for water or latex based paints, they will absorb the water in the water or latex based paints and will quickly swell out of shape. Ox hair bristles are best for interior painting where an ultra fine finish is required. Synthetic bristle brushes are generally used for application of water or latex based paints. Synthetic bristle brushes are man-made plastics such as nylon, polyester, or a combination of both. Nylon bristle brush is mostly recommended for water based paints. 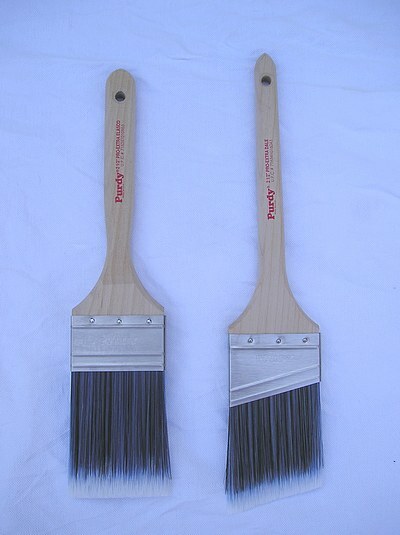 Polyester bristle brushes are used for applying wood stains, shellac or lacquer. Wall paint brushes are the best choice for walls covering larger areas such as exterior and interior walls, ceilings, etc. Wall paint brushes are the most standard and common type of paint brushes. They are thick flat brushes which hold a large amount of paint. Wall paint brushes have short handle with longer bristles. They have the advantages of holding paint and offer the flexibility. For painting small areas such as doors & windows frames, ceilings, wall and corner sections cutter brushes are used. They have fewer bristles than wall brushes. Cutter brushes have long handle which helps to control the strokes on smaller surface. There are major two types of cutter brushes; sash cutter paint brush and oval cutter or trim paint brush. Sash cutter paint brushes are most suited for cutting in around the perimeter of a room. It is full-bodied cutting brush. It is mostly suitable for the application of water-based paint. There are two types of sash cutters. Flat sash brushes have narrow, long, thin handle with trimmed bristles. Because of a thin handle of the paint brush, it is easy to turn and control. It is ideal for painting trim works such as doors, windows, cupboard, etc. Angled sash brush is ideal where you have narrow surfaces or for hard to reach corners such as window sashes, skirting boards, etc. They are formed with a sloping edge at the tip of the brush. The edge of an angled sash paint brush is at a 14-degree. Due to angular design, it allows you extra control. Oval cutter or trim paint brushes are used for trim and edging. The oval shape gives greater control and accuracy on the edges. Trim paint brushes hold more paint in the centre because of oval shape. Paintbrushes are available in an unlimited variety of sizes, shapes, prices, materials, lengths, and bristle types. The incredible variety of choices creates confusion in buyer’s mind. You can choose the ideal paintbrush by selecting combination of bristle type and style of paint brush according to your painting job. For example, if you have to apply oil based paint on a wall, wall paint brushes with natural bristle are most suitable for your job. As different paint requires the different types of paint brushes, always choose the paint brush which recommended by manufacturer or professional painter. Previous PostPrevious What is Domestic Water Supply System?